SEOUL, Oct. 30 (Yonhap) — The top U.S. nuclear envoy reaffirmed Tuesday that Washington and Seoul have the same objective of denuclearizing North Korea amid concerns about a possible rift between the allies in dealing with the communist state. 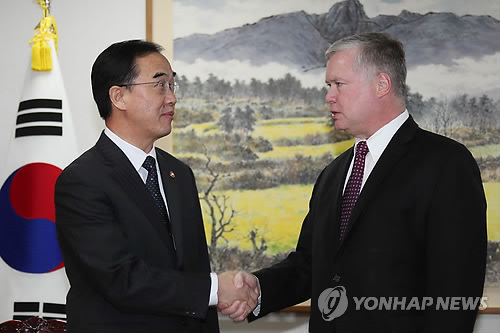 “We want the same thing for the Korean Peninsula: peace and stability, primarily through denuclearization of North Korea,” Stephen Biegun, the U.S. special representative for North Korea, said at a meeting with Unification Minister Cho Myoung-gyon in Seoul. “There are many initiatives that we can cooperate on, and we are looking forward to working closely between the ministry and the U.S.,” he added. Cho emphasized that now is a “very important time” in discussing coordination between the allies in their respective push for diplomacy with North Korea. The meeting comes amid concerns that the U.S. and South Korea might differ on how and in what sequence the denuclearization of North Korea should proceed. South Korea has been eager to bolster inter-Korean relations by expanding contacts and exchanges since their summit in April. The U.S. has been opposed to it, saying sanctions will stay in place until the North completely gives up its nuclear and missile programs. Washington’s apparent discomfort with South Korea’s push to deepen ties with North Korea despite a slower-than-expected denuclearization process has been cited as a major reason for the apparent delay in cross-border exchanges. South and North Korea earlier agreed to start conducting on-site inspections of railways in the North in late October as part of efforts to modernize and connect their rail systems across the border. However, they have yet to determine a detailed schedule for the joint project. Cho’s meeting with Biegun drew attention as it came a day after he told lawmakers that there are areas where the allies differ in dealing with North Korea. Asked by reporters after the closed-door meeting if South Korea and the U.S. are on the same page when it comes to sanctions on North Korea, Biegun declined to comment. The unification ministry later said that Cho expressed during the meeting his hope for close coordination between the two countries and good results from forthcoming U.S.-North Korea talks. The ministry also quoted Biegun as saying that the U.S. will actively cooperate with South Korea to realize denuclearization and establishment of peace on the Korean Peninsula while at the same time improve relations between the two Koreas.